Nearly every designer shares a strong love for typography. Many will never become type designers, or even dedicated typographers, but you’d be hard-pressed to find a designer that didn’t lust after the details of gorgeous type treatments, display and text fonts. Out of every genre hidden in the depths of typography, from black letter to grotesque, I have a soft spot for experimental typefaces. Luckily, so does designer Branislav S. Cirkovic, the creator of TypoFlat. If you’ve ever longed for wild, abstracted letterforms, this site will feel like a playground. All of the typefaces come in various weights and varieties, flexibly packed into vector files for your own use. 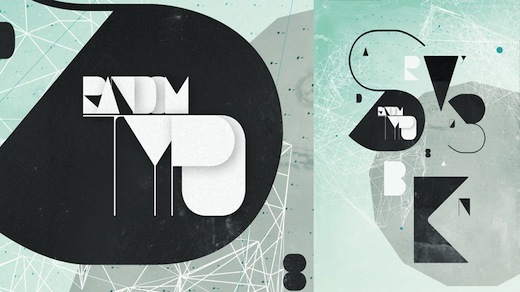 TypoFlat also has multiple sets of strange, yet aesthetically pleasing vector designs. The idea is to have this free flow of creation where no clients or money are involved, just a pure passion for creation and form experimentation. Not every character, image or vector is perfect so please feel free to take full liberty and adjust it so it fits your needs, experiment and never forget to enjoy the process! You might be wondering why Cirkovic decided to release the typefaces in vector format instead of a full-on font file. While he doesn’t offer us an explanation on his site, certain aspects like color and sometimes even texture can’t be translated into formats like .OTF. Also, the conversion process would simply take a lot more time. Take a peek at this impressive set of designs, and check back often for updates. All Cirkovic asks is that you tweet it if you use it. For more inspiration, check out other typography articles from TNW’s Design + Dev channel!